Try Heroku Postgres Data Masking from DataSunrise to protect personally identifiable information from third-party partners of your company. Heroku Postgres Data Masking from DataSunrise provides a solution that intercepts queries targeted to sensitive data and retrieves non-genuine data with fake numbers or characters leaving no opportunity for a requester to see the confidentiality of personal information. Data Masking is a necessary feature when testers or technical support administrators need to access a database that includes credit card numbers, email addresses, phone numbers and other types of personal information. Masked data can still be used for testing or additional program developing purposes. Masking can be static or dynamic. Static masking is made by copying the whole database and replacing the genuine data. DataSunrise performs obfuscation dynamically, which allows avoiding use of extra space for the duplicate database. Masking rules are easy to adjust to different needs. Rule settings provide the opportunity to mask contents of certain database elements, mask data requested by a group of users, hosts or IP ranges, choose among wide range of masking patterns for email addresses, phone numbers, CC numbers and other types of data, set a time schedule. You can add notifiers to receive notifications when certain masking rule is triggered. Heroku Postgres Data Masking tool functions as a proxy between the database and its users. When a user sends a request, DataSunrise intercepts the query. If the query complies requirements of masking rules, DataSunrise changes requested content and sends it to the user. Below you can see a table with personal data that is required to be masked. We create masking rules for several columns (workplace, email, contact, birthdate and credit card number) with different masking patterns. Output results look like this. 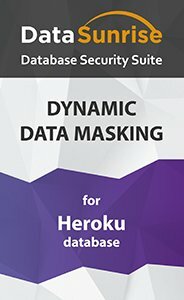 Heroku Postgres Data Masking tool by DataSunrise is a robust addition to the cloud security system that helps to cooperate effectively with third-party companies without affecting privacy and confidentiality of sensitive data.